A business website must be hosted – that is, stored on a computer server where the files and database live, waiting to be accessed over the internet by potential customers. Web hosting is one of the most important components to a successful website, but there’s a lot of confusion about it. In this month’s podcast, we’ll explain what web hosting is, and why quality hosting matters. Web hosting is where your website files and database live on the internet. Web hosting can sometimes (but not always) be bundled in with your domain registration through companies like GoDaddy, which can lead to some confusion. Be assured that web hosting and domain name registration are separate things — and your web hosting can be through one company, and your domain name can be through another. Further, if you’re dissatisfied with your hosting, it’s possible to move your hosting to another company while keeping your domain name registration. What’s the difference between web hosting and a domain name? If you think of your web hosting like a house where you keep all your things (the files and database that make your website work), then your domain name is like your street address you give to people so they know where to find your house. They’re tied together, but they’re not the same thing at all. Why does it matter where I host my website? You’ve invested a lot of time, money, and energy in your website. Most template-based WordPress sites are a few thousand dollars. Custom sites are a lot more. And that’s usually just what you pay people like Prime to design and build the site. There are usually internal fees to take into consideration as well — like content writing or preparation, photography, or meetings to discuss the design or any part of the project. Why would you spend all that money and effort only to have your site hosted with an unreliable or sketchy company? (To go back to the house analogy, it would be like spending money on a huge, fancy house only to place it in a bad neighborhood, or on an unstable foundation.) Quality hosting usually costs a couple hundred dollars more per year, but we think it’s well worth it — read on to see why. What things do I look for in a good web hosting company? Where are they located? Find out where the hosting company is located. Are they in the US, or somewhere overseas? How do they handle tech support? Even if the company is located in the US, tech support might be coming from another country. Make sure that when you need help, the tech person you’re speaking with can speak good English. It’s frustrating enough to need help, but the problem can be compounded when there’s a language barrier. We’ve also found that people working overseas call centers often don’t have adequate training to handle anything but the most basic of inquiries. Do they make regular backups? You should always do you own offline backups on a regular basis and never rely on someone else to run backups, but a reputable host will usually run server-wide backups on a regular basis in case of disasters/emergencies. Do they respond to support/sales questions in a timely manner? For urgent and critical issues, a response time of 2-3 hours is, in my opinion, pretty good. Are they updating their servers regularly? Just like you receive automatic updates from Windows, iOS, Android, etc, the operating systems (and software!) that make web servers run also need updates. In most cases these are updates that need to be manually applied. Do they routinely scan or monitor for malware or viruses? With a bad hosting company, you’ll most likely be the one to notice that your site has been hacked. With a great hosting company, they’ll be the ones to contact you and let you know that something has been compromised, and provide information about how long it will take to have the site back up. That’s a huge difference. Their tech support people are usually difficult to work with. It might be because of a language barrier or because they don’t have the power to really do something to help you. But many times, it’s just that they’re in over their heads with anything but the simplest of problems, and don’t have the training to fix anything more complicated. When you call for help, you get brushed off, or passed around to different technicians. 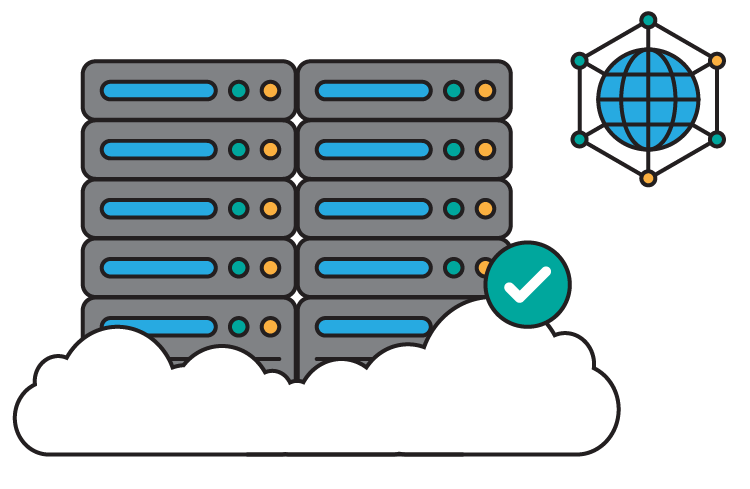 Unless you have a huge company and a huge website, you’ll probably be purchasing ‘shared hosting.’ By huge, we mean something like Amazon. For small and mid-size businesses, this means that your website is living on a section of a web server that could be shared by hundreds of other sites — to continue the housing analogy, it’s a bit like renting an apartment in an apartment building. Some sites may not be as up-to-date or secured as others, which can leave a door wide open for hackers. And like an insect infestation in an apartment building, once hackers gain access to one site on a server, they can usually make their way through the entire server and into your site. So even if you do everything possible to secure and lock down your site, you could still be attacked at the server level because of somebody else’s problem. They may not keep their servers up-to-date. Once a server is set up, bad hosting companies might not apply critical patches or updates, which can be dangerous. Why should you host with Prime Design Solutions? Their technical support is also based out of Pittsburgh. Every technician we’ve worked with has been helpful, empowered, and knowledgeable. Pair has high standards for the WordPress sites on their servers, making shared hosting secure. Pair insists that their WordPress sites must be kept up-to-date, and certain problem plugins are prohibited. This means that even on shared hosting, the other WordPress sites that are on the same server as yours don’t pose as much of a risk of being hacked. Their response time for fixing issues is usually just a few hours. Plus, they assign a dedicated technician to deal with each problem, so there’s an an actual contact rather than a 1-800 number to a service center. They regularly install patches on their servers (and let you know when they’re doing it and why). They scan and monitor their servers for viruses and hacked sites. Further, they are quick to lock things down when/if they find a problem. Even though Pair is great to work with, you won’t have to worry about contacting them. If you’re experiencing a problem, just tell us, and we’ll handle the rest! We also receive any necessary notifications about updates or patches, and manage your site accordingly. It is as worry-free for you as it can be. Prime takes care of all WordPress and plugin updates for you. A major issue with site security is making sure WordPress software and plugins (pieces of code that provide specialized functionality to your site) are up-to-date. WordPress is updated quarterly. Prime will handle these updates for you automatically, making sure your site is secure.